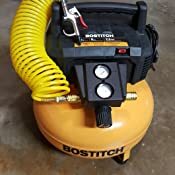 Amazon's Choice for "air compressor"
The Bostitch BTFP02012 6 Gallon 150 PSI Oil-Free Compressor is portable and lightweight. 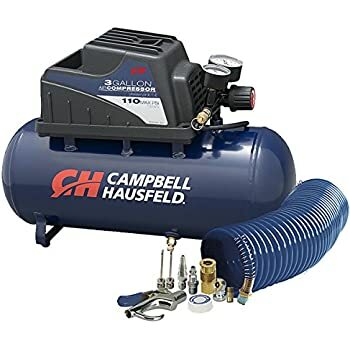 It features an oil-free, maintenance-free pump that delivers 2.6 SCFM* @ 90PSI and a maximum tank storage of 150 PSI for long tool run time with quick recovery. The 78.5 DBA** rating is ideal for a quiet work environment. It has a BOSTITCH high efficiency motor for easy start up in cold weather or extension cord application [14 ga or larger, 50 ft. (15.2 m) or less]. 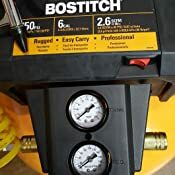 BOSTITCH high flow regulator and couplers to maximize air tool performance. It has two universal couplers to easily support two users. At only 29 lbs weight, this unit is easy to carry and store. 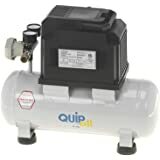 Specs: Max Tank Storage PSI = 150, Electric Power Supply, Oil-Free pump, SCFM @ 90 PSI = 2.6, Tank Size = 6-gallon. I had read some pretty good reviews on this one, and decided to order it. Having been looking around, I found that most 6-gal. pancake compressors were 1 - 1.5 HP. I couldn't find the horsepower rating on this one's advertising, specification list nor the manual. Finally I went to the company website and sent them an email asking what was the HP rating. The next day I received their reply and was disappointed to hear it was only 0.8 HP. So with that I decided to let its performance show its worth. It came two days later (fast!). After reading all instructions I turned it on, watching the time it took to reach its max (150) psi. I was surprised it took only less than 3 minutes! With hoses and a tire filler installed I waited a half hour and checked the pressure gage, and it had not shown any noticeable pressure loss. I topped off the tires of both my car and truck and then bled the pressure off. I then turned the unit around, over, upside-down and inspected it over-all for general quality; Weldment, materials, components and workmanship. Evidently it manages its power well enough to arrive and maintain its pressure rating, and seems sturdy and well made. Btw, I am a retired Quality Assurance Specialist for the U.S. Department of Defense. If I were to inspect this product for acceptance on a gov't contract, I would have no problem giving it my stamp and signature. 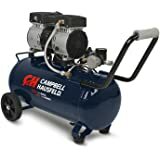 Bottom line, a nice little compressor, especially at that (sale) price! 5.0 out of 5 starsGreat for framing gun! No regret purchasing! Worth it! Great Value! Love this compressor! Worked great for recent fence project! Easy to move and had no issues at all! 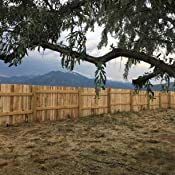 I am so glad that I purchased this and would highly recommend it for framing nail gun or any other projects you may need it for around the house! 4.0 out of 5 starsGreat value! 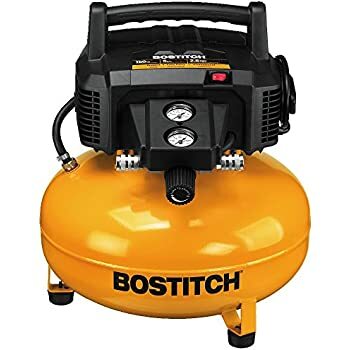 I've used this compressor with a framing nailer and stapler and so far it has worked great. I've shot over 1,000 nails and everything has run smoothly. I like that it is light and easy to move around. Plenty of pressure to drive the tools I've tried. Ear protection is a good idea, particularly when you depressurize the tank as the escaping air is extremely loud and can do damage to your ears. I'm not crazy about all of the plastic and I am hoping everything holds out over the long term, but, so far so good. 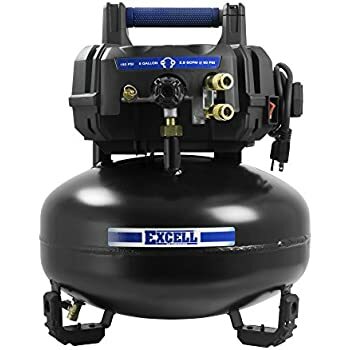 4.0 out of 5 starsGood compressor but maybe a faulty regulator. 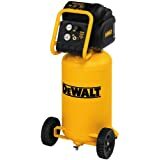 I finally broke down and bought this air compressor. I have needed one for a while, but kept putting it off. I'm glad I did. Now I can use it to build things, blow out my computer cases, and inflate my car and bike tires. One thing I did notice is the regulator on this unit is not very precise. 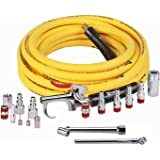 For instance, when I use an air wrench/ratchet that runs off 90 psi, I set the regulator to 90 psi, and when I use the air ratchet, the regulator drops down to 75-80 psi then when I release the trigger, it will slowly climb back up, but never gets to 90 psi. If I open the regulator a bit and get it back to 90 psi on the dial and hit the trigger again, it drops down to the 75-80 psi again, but then does not go back up to 90. If I open it up to 100 psi, the same thing happens again, it will drop down while in use, but will not climb back up to the set psi. 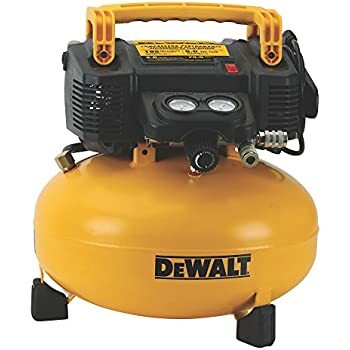 I don't know if I have a faulty regulator or not, but I have tried it with an air chuck too, and I get the same issue. Other than that, the compressor works fine for the basics. 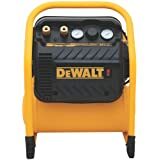 [EDIT] I have requested a replacement unit this morning, I will update my review if the replacement is any better. [EDIT] I received the replacement compressor, and the regulator works great. I have updated the stars to reflect the replacement compressor. 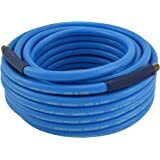 compressor is great: no leaks even with hose attached over a weekend. Tank fills very fast and for how powerful the motor is I would rate it as quiet. Finish nailer: have shot over 1,000 nails through it with nary a glitch. BUT the pressure adjustment nob is slow to respond and sloppy. 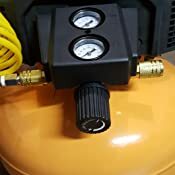 Trust me, set tank regulator to 75-80psi then adjust so nails are flush, then TAPE NOB IN PLACE and adjust the pressure regulator when needed for harder or softer wood. Brad nailer: have a few hundred Brads through itnow with no issues. Not adjustable, but that is easily solved via tank regulator. Don't know why I never owned one of these before. I built a shed this past summer, and without an air compressor and a good nail gun it would have taken at least double the time, maybe two months or more. With this compressor, I was able to finish the job in four weekends. The unit works as advertised. It builds up the pressure pretty quickly, and it's very easy to adjust. 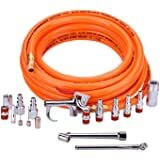 You will need an accessory set, including tubing, as it does not come with all of that. 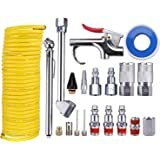 This kit Primefit IK2004-2 50-Foot PVC Air Hose with 25-Piece Air Accessory Kit and Storage Case will provide you with everything you need to get started. It's the one I bought. Releasing pressure after you're done is a breeze. Just pull on the ring and it opens a valve to release the remaining air. Open the drain tube at the bottom and leave it open so that internal condensation can drip out. 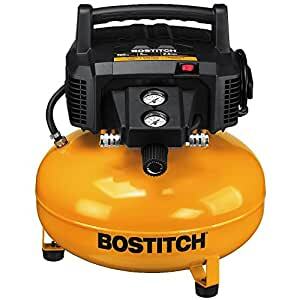 This is a solid product at a good price. You won't be disappointed. 5.0 out of 5 starsYes it is loud. Dont play it in the background. I love this combo. I was thinking of renting but decided to buy for the price and expecting to use them for future projects. I am happy with it. Please dont complain about how loud it is... Its a COMPRESSOR. Sorry, read too many reviews about that. Yea some are probably not as loud. If thats a concern buy some headgear to muffle the sound. 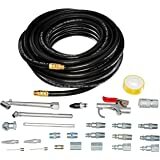 Price was above what I was thinking of buying at Harbor Freight. I figure these should be better quality. 4.0 out of 5 starsSolid, safe bet. Good so far. Fine for tires, nail gun, dusting off things, etc. A little louder compared to what I remember of other pancake compressors I've used, but otherwise seems to work very well.